Holiday lighting is a wonderful tradition, and these tips will help to keep you and your family safe. Use care not to overload your circuits. Do not run too many strings together, the amount of lights on string that can safely be connected differs for each type of light. Read and follow the manufacturer's recommendations. Carefully inspect each string for frayed insulation, loose connections or broken bulbs. Never plug in a string that has bulbs broken open, as the interior filament is a electrocution hazard. 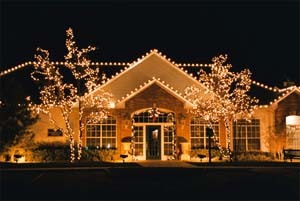 Only use lights outdoors that are approved for outdoor use. Use timers to control your lighting to save more energy. 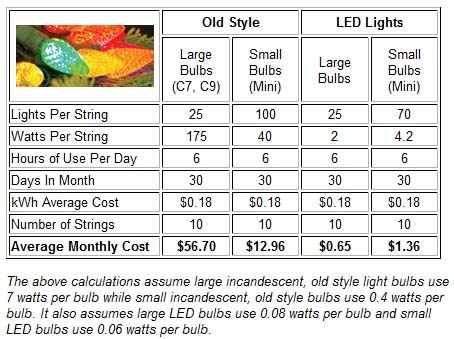 This chart dramatically contrasts the old style bulbs with modern LED technology lighting using as little as 1.15% of the energy of the old style lighting. Another consideration is heat. Never install old style bulbs on a real tree. Think of string of 100, 10 watt lights, that is 1000 watts light and heat. You would never put a 1000 watt heater on a tree for obvious reasons, and these strings are nearly the equivalent of doing just that. Be careful when hanging lights. Loose wiring is more easily damaged by movement from trees and wind. Never use standard staples, as they can cut into insulation and cause a short or shock hazard. Best to use insulated clips to hang lighting. GFCI protected outlets are recommended for all outdoor electrical use. They dramatically reduce the risk of electrical shocks and electrocutions. Use only UL approved exterior grade power cords outside with proper ground (3 prong connector). Never run cords through doorways, windows where they could get damaged or be a trip hazard. Keep all plugs and connectors off the ground, away from puddles and snow. If you blow fuses or trip breakers, reduce the load on that circuit. Never change the amperage if a blown fuse, if a 15 amp fuse blows, reduce the load on that circuit and replace with the exact same type 15 amp fuse. The wiring in the home is designed to only carry the current of the fuse. That blown fuse likely prevented the wiring from overheating and possible fire. If you see flickering lights, sparks, warm switches, plugs, or outlets, or dimming lights, there is a potential dangerous problem that could cause an electrical fire. As always use extreme care on ladders, make sure they have a good footing and are steady. Never touch your exterior power drop! Any contact with a poorly insulated drop will kill you, an aluminum ladder is an excellent electrical conductor. Read more about holiday lighting safety here from Washington State University Extension Energy Program and the Northwest Energy Efficiency Alliance.